Sorting is an important search tool but also quite flexible, with a number of options. Top Picks - the highest weighted assets at the top of results. You can set weighting for Assets individually or with Batch Editing. Latest - the most recent assets based on upload date at the top of results. Oldest - means the least recent based on upload date at the top of results. Weighting 10-1 (same as Top Picks) the highest weighted assets at the top of results. Note that there is no maximum number for weighting - 10-1 is used simply to express the order. e.g. you could set weighting to 1000 or 100 if you wish. Weighting 1-10 - the lowest weighted assets at the top of results. Title A-Z assets are ordered alphanumerically by Asset Title. Note: Asset Title is either the original Filename or the Caption (if a Caption exists). Expiry A-Z - assets are ordered by earliest/soonest Expiry Date at the top of results. Expiry Z-A - assets are ordered by latest/furthest away Expiry Date at the top of results. Released - assets are ordered by most recent Release Date at the top of results. Updated at - assets are ordered by the date they were last updated with the latest on top. An update could be when the metadata was last edited for example. Each account can have one sort type set as the default sort. The default for new accounts is Latest. Contact Brandkit Support to get your default sort order changed. 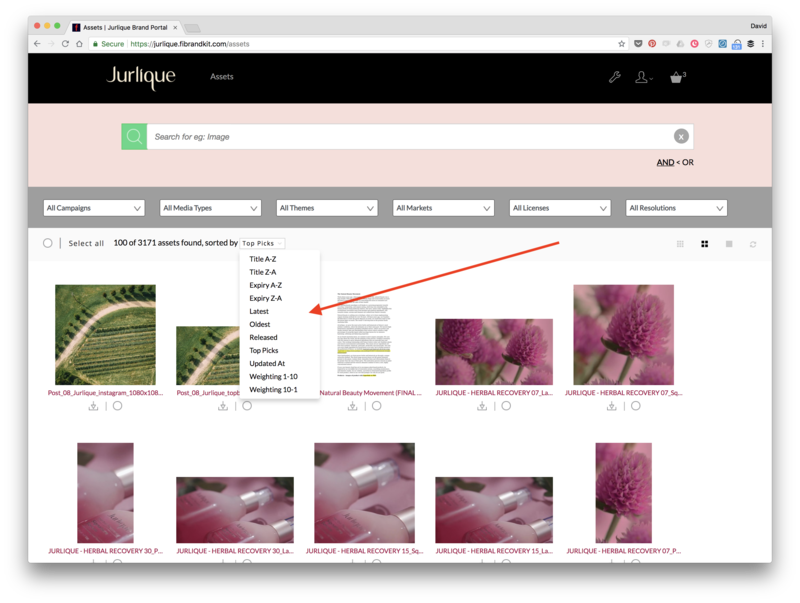 Note: The selected Sort Type for your account, will apply to both the Asset Library and your Portal. It's not possible to have different default sort orders for each.